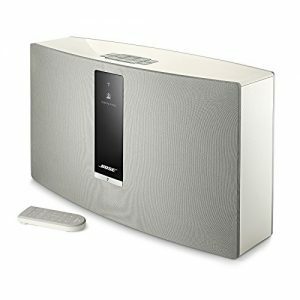 If you like big things then you should definitely take a look at the SoundTouch 30. Not only is it big and heavy – the sound is great, too. This allows you to assign favorites (for example radio stations) to buttons on the device. Especially if you are not satisfied with the power of the SoundTouch 20 you should give the SoundTouch 30 a try: Both models look pretty much alike, but the SoundTouch 30 has everything in bigger. This only applies to the case and the drivers inside, though, while display, buttons and remote control have the same size in both models. The larger case enables more volume, which is essential for a convincing sound. Yet the SoundTouch 30 is sufficiently handy to be placed almost anywhere – except, maybe, for spontaneously taking it to a friend to play at his party: It might just be too heavy for that. All in all we find two important factors for quality sound in this speaker: size and weight. The power supply is inbuilt into the case. Unfortunately, the white model comes with a black cable – unlike the SoundTouch 20, where it is white, so I might just have had bad luck. Setting up the speaker is fairly easy using the SoundTouch App for Windows, Mac, iOS or Android. The app will tell you exactly what to do. If you find using your smartphone for setup too fiddly, then you can also attach the speaker to your laptop with the USB cable that is included. The speaker actually comes with two USB ports. While installing, you can watch the status bar on the speaker display. Unfortunately the USB port can only be used for setup. It is not possible to plug in a pen drive to play MP3 music – the speaker comes with an AUX port though. The AUX cable is not included but you can easily find one on Ebay or Amazon and then attach various devices, such as MP3 players. You will probably be using the SoundTouch App most of the time. It is generally intuitive and easy to understand, but some essential features are not always accessible. Playback controls will disappear while navigating through the app, while volume control is permanently visible. For me it would make more sense if it was the other way around. What I find a bit annoying is the fact, that you can't skip back and forth in the timeline – it is shown with a marker but it can't be ''touched''. What is that supposed to be good for? Also, I was not exactly satisfied with the number of available music streaming services. Spotify, on the other hand, has been integrated near to perfection. Therefore I mostly use Spotify to play music on my SoundTouch 30: I can choose whether to use the SoundTouch App or the much more convenient Spotify App. Unlike the SoundTouch App, which will ''forget'' that you had played a Spotify playlist after you close and re-open the app, the Spotify App seems to be the better choice. It also allows to skip within tracks and can be used on PC or smartphone. Unlike most recent devices, especially multiroom speakers, the SoundTouch speakers come with lots of buttons and with a remote. The buttons can be programmed to presets, such as favorite radio stations or playlists, which can then be started by the mere push of a button. I found the included remote quite helpful: It works well even without direct visual contact to the speaker and it has a large number of buttons. In multiroom mode one remote can control multiple speakers. And, naturally, it offers the traditional advantages of a remote control: You do no permanently have to grab for your smartphone, unlock it and start the app just to change the volume level. One great thing about SoundTouch technology: You are not forced to use a router. It will only be necessary for wifi mode and using the app – if you don't need those or don't have a router you can just switch to Bluetooth mode, quickly pair your smartphone and stream music. And it all works really reliably and fluently! Once your smartphone has been paired, it will automatically connect to the speaker when it is set to Bluetooth mode. If neither a router nor Bluetooth are available (for example due to a low smartphone battery) you can easily attach your MP3 player through AUX. The cable is not included. These features make this speaker our technology hot tip. 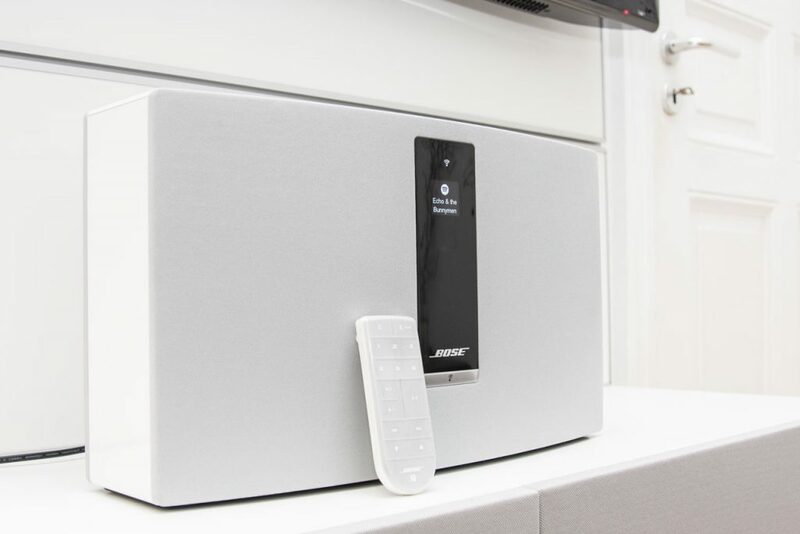 You can find out more about the details of multiroom broadcast in our article on Bose. I have already mentioned two important features that can indicate good sound quality: size and weight. And, no surprise at all, the sound is simply awesome. Highs and mid-range are extremely precise, accompanied by a full bass. The speakers can be played at an astonishingly high volume. I mean really unusually loud and extreme, but this won't sound good at all. There is a bit too much emphasis on the highs, the same as with the SoundTouch 20, while the low range is not always as present. Therefore I would not recommend this speaker for very loud playback, especially for playing bassy music at a high volume. Unfortunately, the app does not come with an equalizer: The only available option is to cut the bass – which is by default already set to maximum. This is a bit of a drawback, because in the long run the strong highs are tiring the ear when playing the music loud. This speaker offers high end technology combined with very convenient handling and an excellent sound. Unfortunately, as of this date there are only two music streaming services available.